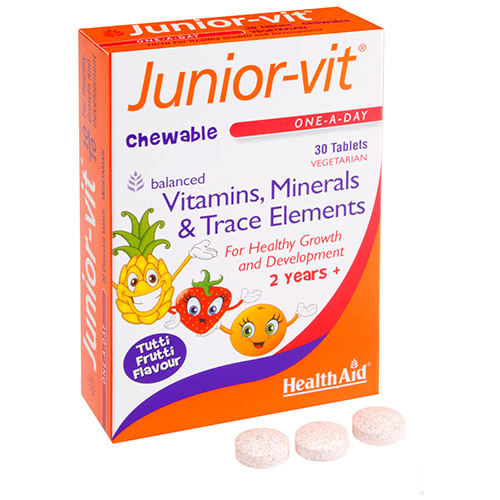 HealthAid Junior-Vit Chewable - Vitamins & Minerals may help maintain optimum growth and development for your child. It is a balanced multivitamin and mineral formulation that may support strong bones, healthy teeth and a sharp mind. It is rich in B Vitamins, Iron, Vitamin D, bioflavonoids and Fructo-Oligosaccharides (FOS) to help maintain healthy skin and the digestive system. Children who do not obtain sufficient nutrients from their diet due to poor eating habits. Children lacking in energy due to poor sleeping patterns and anxiety. Children who have difficulty with swallowing tablets. Athletic children or those who do regular sporting actives at school. Children on medication or those recovering from illness. Children who generally lack mental stimulation, focus and concentration. Free from: yeast, gluten, wheat, soy, dairy, artificial colours & preservatives. Children 2+ years: Chew 1 tablet daily with food. Children 6+ years: Chew up to 2 tablets daily with food. Below are reviews of HealthAid Junior-Vit Chewable - Vitamins - 30 Tablets by bodykind customers. If you have tried this product we'd love to hear what you think so please leave a review. My daughters hate its taste but I tasted it and it seems sweet. Anyway, I would eliminate the iron. I'll try again with them. 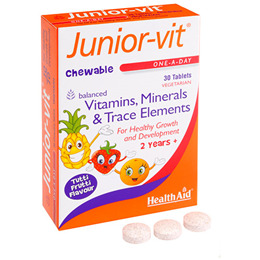 HealthAid Junior-Vit Chewable - Vitamins & Minerals may help maintain optimum growth and development for your child. It is a balanced multivitamin and mineral formulation that may support strong bones, healthy teeth and a sharp mind.